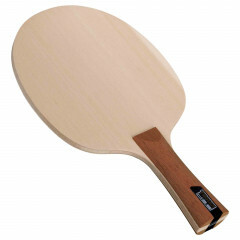 Reintroducing the modernised H-3-9 Hinoki wood blade. This design comprises of 1 thick middle ply and 2 thinner outer plies. Although this blade is very fast, it will give you a higher degree of feeling over the H-1-9 design. The H-3-9 design is now available in a choice of all grip types. Tibhar Blade H-3-9 is beeing added to cart.